It's not the nordic track machine found in your living room, Missoula nordic skiing offers the beauty of snow covered tree canopies, rolling hillsides, open fields, and miles of groomed trails. Cross-country skiing is a great way to get out and enjoy a beautiful winter day. Don't have the gear, rent it from one of the local outdoor gear stores. Missoula nordic skiing offers easy access to miles of groomed trails. Glide peacefully under snow covered tree stands. Sometimes a little serenity is all that one needs. Cross country skiing is the perfect way to spend a quiet winter day. Glide peacefully across open fields, through forested woods and along mountain sides. You won't have to go far, the numerous groomed and un-groomed trails found around Missoula will keep you busy all winter. The mild winters of Missoula Valley offer many great locations for nordic skiing. Listed below are view locations to get you started. Enjoy over ten miles of groomed trails as you glide through the snow covered ponderosa pine and western larch stands. These trails offer something for all levels, smooth flat parcels for beginners, moderate slopes for the intermediate student, and steeper terrain for the experts. From Missoula, take S Higgins Ave east to Pattee Canyon Road/County Road 533. The trails start 3 miles up the road, near the picnic area. Rattlesnake is Missoula's backyard playground. Groomed nordic trails stretch from the main trailhead to Franklin Bridge. Follow the main trail or veer off into one of the many drainages for a bit more incline. Groomed or not, the Rattlesnake will set a tranquil atmosphere as you glide along among the trees and quiet. From Missoula take Van Buren east and drive 4.5 miles up Rattlesnake Dr to the main trailhead. Cross-country ski your way to the top of Deadman's Ridge. The subtle incline will get the heart pumping, but at the top you will be rewarded with postcard panoramas of Missoula Valley and to the south, the Bitterroot Mountains. Take Hwy 93 south to Blue Mountain Road. The trailhead is one mile up the road. Just a mile northwest of the lake you will find 11 miles of groomed trails. These trails cater to the experienced glider with 7.5 miles of difficult trails and 1.6 miles of expert trails. The harder the trail, the less people you will find, so enjoy the tranquility and quite of gliding through snow covered tree stands. From Missoula, take I-90 east to Hwy 200 east. Take a left heading north on Hwy 83, continue a mile past the lake and park at the trailhead. Not your usual cross-country adventure. Here, you will pass through the remnants of Garnet Ghost Town. You can even spend the night in one of two rustic rental cabins. The flat terrain and interesting sites make this a winter experience to remember. You will have to watch out for snowmobiles in this multi-use area. From Missoula, take I-90 east to Hwy 200 east. Take a right on Garnet Range Road. The road is closed as of Jan.1, so hit the trail before this time or snowmobile in and then hit the trail. Easy access and trails for all levels make Chief Joseph Pass one of the best places for a day spent cross-country skiing and the trails are groomed once a week. Take one of the eight loop trails and if you get cold, step into one of the warming huts. Sorry no dogs. From Missoula, take Hwy 93 south to Chief Joseph Pass. Turn on Hwy 43, at the sign, and the trail system starts on the north side of the road. There are numerous outdoor gear stores throughout Missoula that can set you up with the booties, skis and poles you will need to enjoy a bit of cross-country fun. Rentals average around $15/day, but search around for the best price. Clinics are available through the Missoula Nordic Club. In addition, the nordic club offers moonlight cross-country outings. Talk to local outfitters about other tour possibilities. 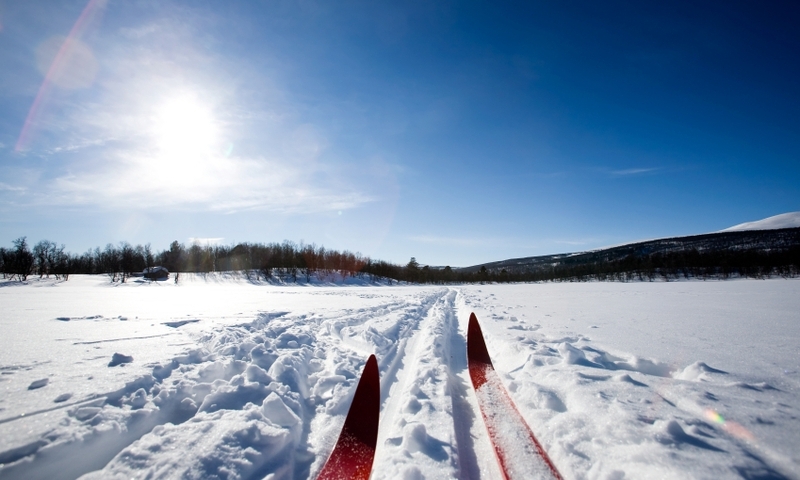 The Missoula Nordic Ski Club offers information on grooming and nordic events in the area.